EasyFeelProducts: What are Modern Cloth Diaper (MCDs)? What are Modern Cloth Diaper (MCDs)? A Modern Cloth Diaper (MCD) is a reusable diaper made from natural fibres, man-made materials, or a combination of both. 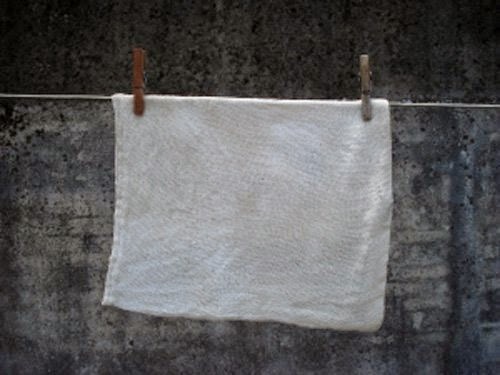 They are made of natural fibre cloth materials includes wool, bamboo & hemp. Man-made materials such as an internal absorbent layer of microfibre towelling or an external waterproof layer of Polyurethane Laminate (PUL) may be used. Polyester fabrics micro-fleece or suede-cloth are often used inside cloth diapers as a "stay-dry" wicking liner because of the non-absorbent properties of those synthetic fibres. Modern cloth diapers come in a host of shapes including all-in-one diapers with waterproof exteriors, fitted diaper with covers and pocket or "stuffable" diapers, which consist of a water-resistant outer shell sewn with an opening for insertion of absorbent material inserts. Modern cloth diapers are one-sized diapers that use snaps on the front rise of the diapers to allow them to grow with your baby. Times have changed for cloth diapers. Gone are the days of traditional langots, cloth nappies, safety pins, plastic pants & leaks. Today's modern cloth diapers have been redesigned to be as easy to use as disposables. Flushable liners, snap closures, hook & look closures and high-tech fabrics are used to create comfortable and functional diapers that are easy to use. Easy-to-use features and eco-friendly nature of cloth diapers can make them the right choice of parents.There are 10 basic type of cloth diapers. Lets explore in detail each type and how to use each of these. 1. FLATS: Flats are large squares of single-layered fabric that can be folded in a variety of ways. The fabric is usually made of cotton. They require you to fold them into a desired shape, and then fasten on baby and add a cover over the top. 2. PREFOLDS: Prefold diapers are rectangular pieces of cloth folded into three sections. The middle section is the most absorbent layer. Prefolds can be folded around a baby and fastened with stereotypical pins or a snappi, or they can be folded in a trifold and laid inside a cover. You must always use a cover with prefolds. Prefolds are supposed to be a really great diaper for the newborn stage. 3. 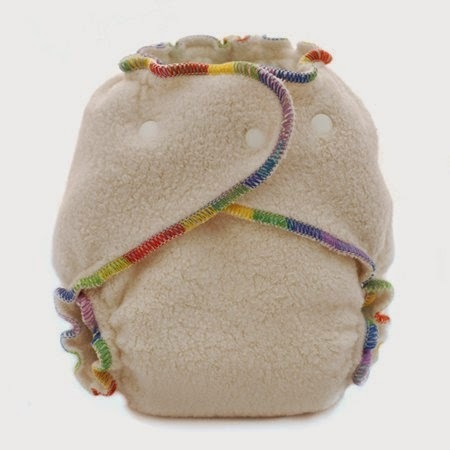 FITTEDS: Fitted diapers are usually made of cotton, bamboo, hemp or fleece and are very absorbent - but not waterproof. They require some kind of waterproof cover to be used. Fitted diapers are hourglass shaped and do not require folding. They are ready-made to fit your baby's body. Fitteds comes in snaps or velcro closures. Key disadvantages of fitted diapers are that they are not waterproof and are more expensive. Key advantages of fitted diapers are that they are highly absorbent, easy to fasten on baby, and are great at containing messes due to the use of leg elastics. 4. CONTOURS: Contour Diapers are a cross between Prefolds & Fitteds. They are already shaped, but they require pins or a snappi for closure. They also require a cover. They are shaped like an hourglass. 5. HYBRIDS: Hybrid diapers are a cross between disposable & cloth diapers. Often, they come with a washable outer cover, and you have the option of using a biodegradable disposable insert or a washable cloth insert. The Hybrid style got its name because the absorbency layers used may be either cloth or disposable. For example, you may choose to use cloth absorbency whenever at home, but use disposable when heading to daycare or travelling. Hybrid system comes in a sized approach and in a one-sized option. Gdiapers are probably the most widely known hybrid diaper system. 6. POCKETS: Pocket diapers are the first true "modern" cloth diapers, and they are very daddy/babysitter-friendly diapers. They require no cover and comes in either a snap or aplix/velcro closure. They are called pocket diapers because each diaper comes with a pocket that must be stuffed with an absorbent insert. Most pocket diapers are lined in either microfleece or microsuede cloth - which are stay-dry materials, meaning that your baby will still feel dry even when he/she is wet because the urine passes through the liner and absorb into the insert that is inside the pocket. Inserts are either Microfiber, cotton, bamboo terry, bamboo charcoal, bamboo cotton or hemp. 7. SLEEVE DIAPER: Sleeve diapers are very-very similar to pockets. They have two openings in the pocket - one on each end. The benefit is that you don't have to unstuff the diaper when it is soiled. You just simply toss the whole thing into the wash, and the washing machine will agitate the insert out. A popular sleeve diaper brand is Thirsties. 8. ALL-IN-ONES: All-In-One diapers are a premium type and are usually pricier than the other types. The benefit is that there are absolutely no other steps. They require no covers or stuffing. They are all one-piece-Just like a disposable! This fact makes them especially popular with dads, grandparents & sitters. Absorbency layers are sewn inside of an outer waterproof cover. Key disadvantages of AIO diapers includes longer drying time. Key advantages is the sheer simplicity of the design, the trim fit and that they are a good "all around" choice that can be used in almost any situation. 9. ALL-IN-TWOS: All-In-Twos are similar to pocket diapers except that instead of stuffing a pocket, you snap the insert inside the diaper. In AI2s, Insert lies directly against your baby's skin. Insert can be attached with cover with the help of snaps or velcro. 10. DIAPER COVER: The diaper cover consists of an outer waterproof cover and flaps are there inside the cover to hold the insert in place. 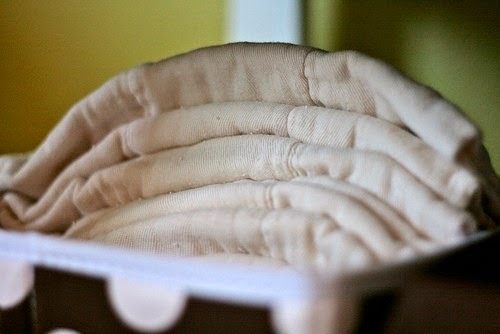 In diaper cover, insert get tucked under the flaps in the cover and lies directly against the baby's skin. When your baby needs a diaper change, you can just swap out the insert and keep the same cover (Unless the cover gets soiled, in which case you change that too).